This is a double MS setup. A step forward with Blumlein stereo, I tried this setup with extra center Omni channel. In this way, the stereo sound stage can be altered and even decoded to surround sound. This is the audio file download link. Comments welcome. Inverting polarity on both figure-8's switches those X/Y patterns from forward facing to rearward facing. Inverting polarity on one figure-8 switches those X/Y patterns to sideways facing. Inverting polarity on the other figure-8 switches those X/Y patterns sideways facing in the opposite direction. Inverting polarity on the omni switches those X/Y patterns from forward facing to rearward facing (just like inverting both 8's) but also inverts the polarity of the output. Just fyi, b9 says they're out of stock on them at the moment- but they do have a new version in stock. He said they are "direct cable out"- but I didn't get an answer if it's active or just a built in XLR? 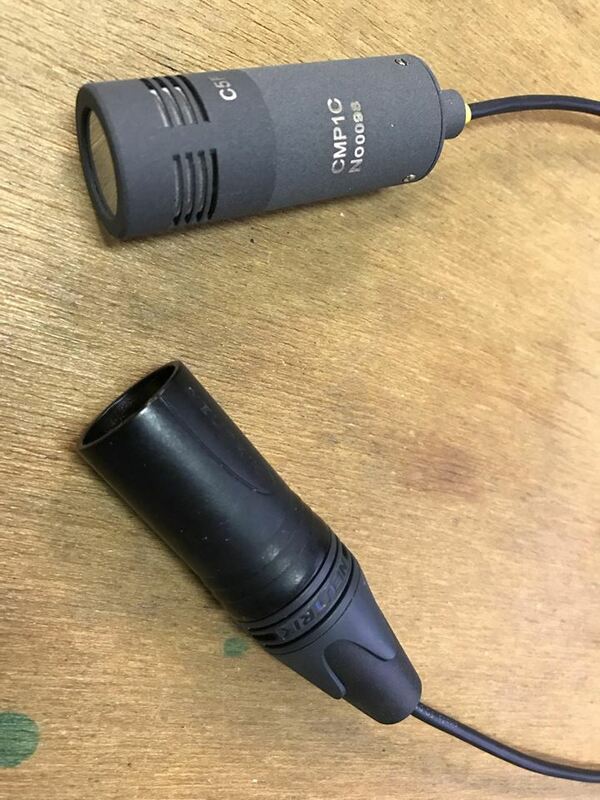 I'm curious about this- it seems like if I'm putting them on a stand and connecting them to another XLR, there's no real functional difference, right? I think they're a bit smaller- so if that's a sticking point, I get it, but I'll be open taping so it seems moot. The thing that has me apprehensive is that it would potentially be an extra point of failure which provides no real benefit. CMP1C is exactly the same in electronics with CMP1, only difference is to add a cable between the PCB and the XLR plug. 1. Need extreme short microphone length, such as for mounting inside the VR Ball. Only 100mm for a microphone; including XLR plug for standard microphones. It is certainly not possible and special low profile plug is needed in such case. 3. Provide better vibration isolation. Low profile flexible cable transmit much less vibration energy than standard thick mic cable. 4. Added extra possibility: Stereo version, 3-channel version, and 4-channel version uses a single plug. User run simple multi pair cable from microphones to mixer/recorder/pre amplifiers, reduce cable complexity. All of this looks very cool and interesting... just marking this thread to come back to. I would be curious if anyone out there has tried the Wide Cards in NOS, I would think that might be quite nice way FOB (up front). b9 says they're out of stock on them at the moment- but they do have a new version in stock. He said they are "direct cable out"- but I didn't get an answer if it's active or just a built in XLR? I like the "active" (style) set up direct to xlr. the "collette" looks to be a bit longer than say the Schoeps or others, but it's clean. - Are the capsules interchangeable? could the wide card (CM131F) , or omni cardioid (CM 130H) with high frequency boost t be available in this configuration, as a matched pair perhaps? what exactly is there difference between the wide cardioid and the Omni card? The capsules are interchangeable, Almost all B9audio capsules can be fitted, except CSM88. Difference bewteen 30 and 31: 30 is more omni like, so it is an "O". 31 is more cardioid like, so it is "1". In case you need them for sound reinforcement, 30 could be in the same situation as an omni, and 31 could be almost used as a cardioid. Certainly, still easier feedback compared with standard cardioid. Y'all sold me on this. I'm practicing setting up w/ my new shock mounts & stand/stereo bar and I can see how it would be a benefit. Going to purchase a pair right now. Just wondering if one wanted to order a matched pair of capsules with the "active" style "collettes" to mini (starquad-or similar) cable to XLR how would one do so and what would be the costing? there appears to be no information or pricing on the site about any "active type" set ups. will the pdf brochure etc. and website be updated soon? Yes, we will update the website and product info soon. Planning to make another brochure on the CMP1C combinations. People, please: "Colette" is a name used by Schoeps GmbH to identify their CMC microphone series. Among the features of this series is Schoeps' original, patented scheme of "active" accessories (i.e. accessories that contain active circuitry). These accessories can be placed between the capsule and amplifier of a condenser microphone so as to allow unobtrusive placement of the capsule as a lightweight unit separate from the amplifier, or for other purposes such as signal processing (e.g. very sharp, active low-cut filtering). "Colette" isn't a generic term. There's no such thing as "the colette" of something--even if that something was made by Schoeps. So would mic capsule holder be more appropriate? Thx. In all honesty I didn't know what part of the microphone you were trying to describe, and I still don't. If you meant the part that contains the circuitry--that's the amplifier. Or maybe you meant the short, narrow part at the back of the amplifier where the cable exits. I guess you could call that the "neck" of the amplifier, but that's not any kind of standardized term.